I blended into a fine powder for topping candles your Besamim money mixture, Fenugreek, a whole nutmeg, cinnamon chips, blue flag root, alfalfa, sassafras, Irish moss, lodestone gravel, magnetic sand, pyrite gravel, and High John bits and pieces. My goal is to make the best all around money drawing, growing, keeping and winning in any form, more of it. I am super excited to say that the brown resulting powder is beautifully charged with magnetism to the point that wherever I hold a weak refrigerator magnet to the mason jar, i feel it being pulled. My question is, are there any other herbs, roots, animal curious that I could add to make it as powerful as possible? This blend is made to go on the candles I make for money winning, drawing, getting, etc. That sounds like a great mix. Since our Money Herbs Mix (Besamim Spices) contains several herbs not listed here, you do not need to add them. Sigh, this makes me feel so great to know I've made a solid one. After a lot of sparks and banging around for a minute, my Vitamix created a beautiful powder which I added to the mix in the mason jar. Now, it definitely has a stronger magnetism AND it has a beautiful gold glisten to it. What a perfect and beautiful product I have made with your products. I am a very avid gardener, and this year finally installed some raised beds with the goal of starting an herb garden focused on magic. I am also looking into installing lights in my apartment and growing herbs during the winter for personal and magical use. I live in the northeast. For those of you who use herbs and grow your own, I would like to hear about which plants you have found to be particularly useful and rewarding to grow. Also, is there a way to prepare a garden magically to make it an extra wonderful place for making things grow? 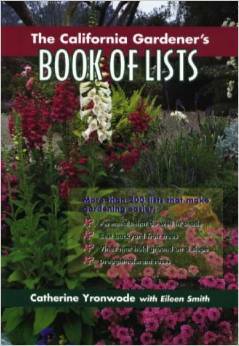 What do you do in your gardens and what do you recommend? Hello fellow green thumb! 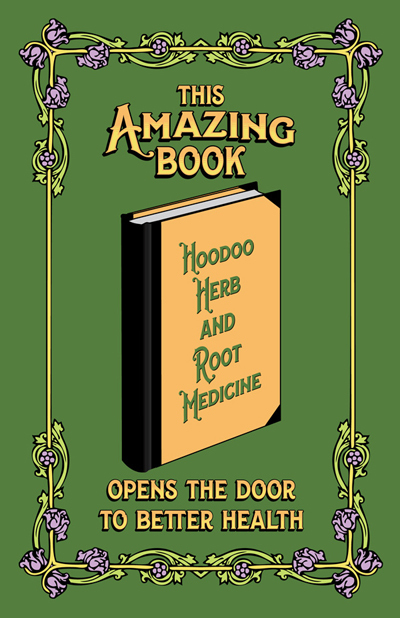 I'll start off with, if you have not bought the book "Hoodoo Herb and Root Magic," it's practically a must for working a magic garden. I began with typical kitchen herbs like rosemary, thyme, mint(might want to pot), bay laurel (grows very, very slow) and catnip. Then moved on to roses and would like to see if peonies can grow in pots. You could probably grow nettle and comfrey easily in the beds. Maybe Basil under the lights. You won't be able to grow everything you need but that is why communities like these are so important. I'm not even sure what zone John the Conqueror will grow in... or Master Root for that matter. Still researching that one. I have that book! Another fantastic book I use is Paul Beyerl's Compendium of Herbal Magick-- it's a treasure. Alas, I think peonies need to be in the ground. I have 15 of them though if you ever would like a bare root! I have four English roses, but they are so veeeeery delicate-- next year I want to see what I can do to encourage more blossoms. I need to learn the art of pruning. What zone are you in? I have a bay laurel, lemon verbena, and rosemary in pots and adore them-- but I dread bringing them inside this winter. They will die. My apartment does not have the best light. I was thinking about nettle for next year! Comfrey sounds like a great idea. Thanks! Thanks for endorsing my book, and if you want some further ideas, next time you order from the shop, be sure to ask for "the three green flyers on herbs." These are extra go-alongs that i distribute to folks who purchase herbs from us. their actual titles are""
Another book i have co-written and which deals with herbalogy, specifically herbal medicine, is "This Amazing Book" by Sunrae and cat yronwode. Hi Cat! Loved the last podcast! Madame Pamita is amazing! I was just about to order some herbs for dream pillows, and I will be sure to ask for these! Thanks for mentioning the other book-- I am always looking for more resources! I'm living in California near the Bay Area so 9b I think. I'm originally from Upper MI though and spent some time in Germany. No matter where I go, I try to have at least a little garden. I hear you about the peonies... I wish they liked pots. I think Cali is just too dry and hot for them. It makes me sad because they really are my favorite. Nettle is great in a tea! Very good for vitamins and taking off jinxes! Double duty. I bet you could grow Southern John (trillium) and Solomon's Seal if you have good soil and a little shade. Both look so beautiful too. Pruning is scary at first. You hear so many horror stories about bad cuts leading to rot and poor growth. I pruned my fruit trees in WA after looking at the agriculture guides published by state universities and it really helped open up the plants for air flow. Cut down on bugs too. I will defiantly request the flyers and add the book on my next order. I'm especially excited about the flyer on Wildcrafting! Thank you for the suggestions. Yes, peonies do like cold winters, which we do not have in Northern California. 1) Recently, I was given a red chicken foot and a black cat bone by someone whom I had working for me. I was told to hang the chicken foot near a door and to wear the black cat bone on my person. The thing is that I want to wear the black cat bone around my neck but there is no way to do so. You see the bone is so very thin and very small that I am afraid if I try to drill a hole in it that it may be damaged. There is also the worry that drilling a hole in the bone may cause not only destruction of the bone but may somehow stop the bone from doing what it is intended to do. Does anyone have any idea how I could wear this bone on my person I mean the only other thoughts I have is to place it in my bra. My fear is that it my get lost during the many examinations, procedures and test I have to go thru doing my many doctor's and hospital visits. 2) I would very much like to obtain another cat bone however, I would like for it to be one that would make me invisible. Does anyone have any idea where I would obtain such a bone? 3) I would like to have a very good and very strong African American reader/conjure/hoo doo person who lives in New Orleans to do some work for me. Does anyone know of a person that fits this description? 1) Put in a little leather bag. 2) Read more here: http://luckymojo.com/blackcat.html We do not endorse animal abuse, but you are free to read about it. I have a long history of many types of Magic but when I became more interested in Hoodoo on a trip to New Orleans it really spoke to me. I love plants and plant medicine but beginning to work with roots is very powerful to me! They are like darling little pets (i see faces in them and they have different personalities). I enjoy feeding them and spending time with their energies. I have not yet fixed them as Im waiting for the proper time and purpose and I am not 100% how to do this properly. If not given a home in a mojo, how would one best take care of each root? I understand about feeding with whisky and anointing with oil but would you keep them tucked away in special place? a box? a bag of its own? or is it better left out on an altar? Welcome to the forum and thanks for your kind words about our products and service. The topic of how to store roots and herbs that are not in current use (e.g. in a mojo bag or dressing a candle) is one that has been discussed before in this very thread. Start on page 1 and read the thread and you will see mention of it in the past. I don't want to repeat what i wrote then, so i will just offer the thread to any newer members who also want to talk about herb storage. If there are enough posts on it, i may split it out into its own thread. We also have a free flyer on Herb Storage available from the shop when you order herbs. Just askk for it by name in the message area of your order. The medical qualities of the herbs we carry are described in this book, with traditional folkloric remedies for home-herbalists to try. I have a Rose of Jericho that I water every now and then. The water I soak it in smells really good. What sort of spells and rituals might it be good for? I've mixed it into a floor wash before and enjoyed the effects. It made things feel fresh and renewed. Any thoughts? The plant is often used to bring things back to life, to spout, bring anew again, because it can be a dead heap, get water and restore it self, I would use it in spells relating to that. I know business owners who use them in the shop water them for profit and customers. Happy New Year !!! I was wondering what herbs I would use in a honey jar to sweeten up my boyfriends mother to me. She's a tough one. LOL. I just really want us to have a harmonious relationship. We don't need to be besties but I would like for her to let me in a little. And give me a chance. Well, as some folks will no doubt have noticed by now, i am working my way through this entire section of the forum, making sure that every herb and root we carry has a thread for questions and answers, and that within every thread these are pictures of the packets; links to books about the magical, medical, and culinary uses of the herbs; links to discount specials on the herbs; and buy-it-now buttons for everything that has a link. We stock almost 200 different herbs, some of them in multiple forms, such as whole, cut and sifted, or powder. The variant forms will be bundled into each herb's name, so you can find them most quickly. Many extant threads simply need updating, but many herbs have never had their own threads, even after all these years (the form went live to the public ten years ago in January 2009). It is my hope that as more people become of aware of the basics of hoodoo, they will come to appreciate the power of rootwork -- literaly working with roots and herbs. If herbs are kept in glass jars does that stop the drying process or is it better to keep them in plastic sealed bags? Herbs should be fully dried prior to storing them and this cannot be done in a jar nor a plastic bag. Once they have been dried completely, glass jars are preferred because they are moisture and air proof, if well sealed, which plastic is not. We have a free flyer on storing and preserving herbs. You can pick up a copy if you come by the shop -- but it will also be included in the new "Red Folder" book distributed at he Hoodoo heritage Festival as part of your ticket price. If the root of the plant is unattainable, would substituting a different part of the plant be a valid alternative? I’m having difficulty sourcing Sampson Snake Root and seeds are available. This question is assuming that growing it myself is an issue given location. 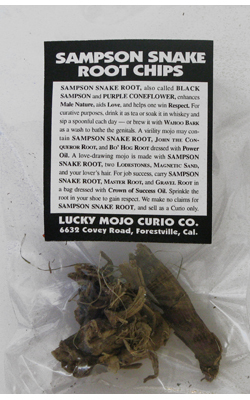 We've got Sampson Snake Root! It was briefly out of stock due to seasonal limitations, but we have it now. We have just received ten pounds from our best and most experienced wildcrafter, so order away! I wanted to purchase a masters root but your site says it’s out of stock or discontinued. Will you be getting more of it soon or is it no longer for sale? You should contact the shop directly, as we have no information here on what is or is not currently in stock.